I'm kind of glad that this one came up next in the rotation. It's as if in challenge to Rose City Reader's suggestion, after last Sunday's postcard, that there were no more realms of boringness left to explore. So I had a nice leisurely view of the table setting while the site loaded...time to think, OK, dated tablecloth, and the fishtail hanging off the plate is a little tacky, but I could eat there happily enough...then I finally scroll down and see the gift shop, and feel all icky inside. And now of course I remember the postcard. What were you thinking, Loretta Lynn? The shame of it! And yet, it is very very close to "here's a photo of the rack of postcards I spun in the gift shop where I bought this postcard"--hence meta-boring at its most sublime. Did you not realize, mrs.5000, that those were turnip greens in the side-dish bowl? (I was careful to marry a non-turnip-greens-eating Yankee, personally.) If you ever want to know why the South has a large percentage of the obese states, look at that postcard! 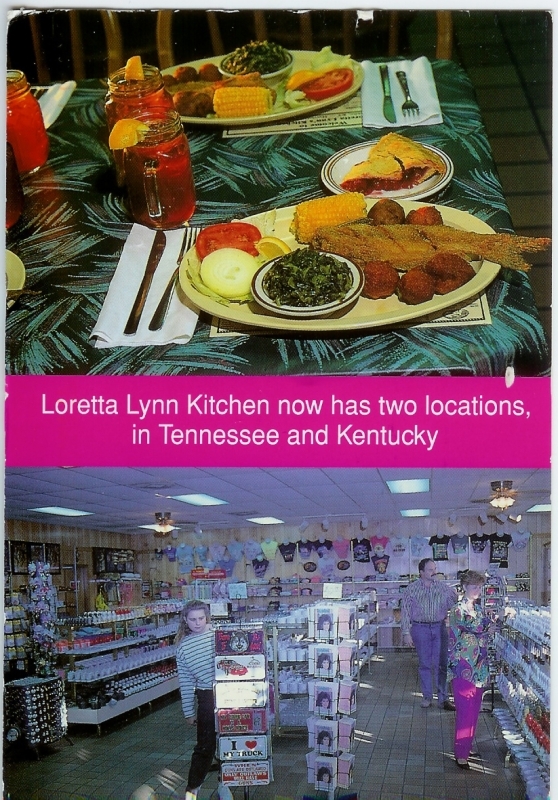 Query: Is Loretta Lynn's gift shop worse than the Cracker Barrel gift shop? (For instance, do you have to go through the gift shop to get to the dining room?) Defend your answer. Elaine: I think you would find that Mrs.5000 has a very intimate relationship with the cooked greens. I thought the same thing, about the postcard of the rack of postcards where I bought this postcard. I do agree that this postcard explores a new frontier of boringness. Not to mention all that STARCH on the plate, including unnecessary breading on the fish. Smell the grease! Elaine: to enter the restaurant, you had to go through sort of the foyer of the gift shop, but did not traverse the whole thing as in Cracker Barrel. There you have it, from the horse's mouth! I wish to clarify that Heatherbee is not, in fact, a horse. It's an expression.